The standard Microsoft Dynamics NAV service module (alongside with the general resource planning capabilities) provides an initial level of ERP functionality to support service-savvy processes and businesses. These functions enable the users to manage service quotes, orders, contracts and the related admin processes such as invoicing etc. However, the standard Dynamics NAV service capabilities fall short when it comes to supporting a service business end-to-end; means: from the customer over the call center, over the service dispatcher, over the service technician back to the cutomer again. This blog post sheds a light on how to achieve exactly this end-to-end service management, scheduling and execution process when working with Dynamics NAV. Service order dispatching. Admittedly, there is a dispatch board functionality in Dynamics NAV which allows allocating a service order to a service technician. But still, this dispatch board is rather basic, and provides no graphical interface at all. It works based on tables and filters. Hence, allocating or re-scheduling service orders to the technicians is somewhat cumbersome, and an agile reaction to unplanned incidents is not that easy to achieve. Mobile service technician integration. Let's assume issue #1 is solved and customers have a transparent and visual service schedule with all drag & drop capabilities required to manage the service processes in an agile manner. This immediately leads to the question how easy the dispatcher can inform the remotely working technicians about new service order assignments or changes of the schedule. Let's look at both challenges step by step ... with the aim of finding a powerful end-to end service scheduling solution. NETRONIC's Visual Service Scheduler (VSS) is a fully integrated add-in for Dynamics NAV which supports the day-to-day work of the service dispatcher. Of course, the VSS also allows creating dependencies between service tasks, cancel or change service order allocations and modify the length and timing of service orders. In short: The VSS efficiently complements the service module of Microsoft Dynamics NAV. When discussing the VSS with customers or partners, virtually everybody acknowledged that it appropriately solves the issue #1. However, we also often get asked about issue #2 - as customers are pretty keen on pushing such a great service schedule out to their technicians. An obvious answer would have been to recommend partners achieve a Dynamics NAV and Exchange/Outlook integration. However, there are more options than this. 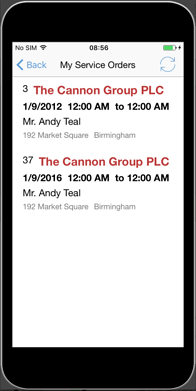 One option is partnering - and we found that our Visual Service Scheduler nicely works hand-in-hand with the Anveo Mobile Service App. ANVEO, provider of powerful add-ons for Microsoft Dynamics NAV, closes the gap between dispatchers and service technicians with their Mobile Service App. The app offers quick and easy access to all relevant NAV data: Service orders, service products and customer data can be accessed by the technicians by their tablet PCs or smartphones. Hence, each service technicians always has all relevant information at his fingertips. And the clou is: this also works offline, i.e. when the technician is working in a area where there there is no network connection. Hence, the access to data is always available regardless of network coverage. Synchronization between the mobile device and Dynamics NAV will be done when an internet connection is available and only changed data will be synchronized so that the data volume remains manageable and synchronization can happen even with slower internet connections. The App enables the technician to see his orders, get information about the to be serviced items, best practices, take fotos of the defect part, and communicate back with the dispatcher and the VSS. In addition, the technician can have the customer sign on his smartphone and hence close the service ticket while being onsite. I feel, this is just another great example of 1 plus 1 totaling to more than 2. The combination of the Visual Service Scheduler and the Anveo App (btw: you can see it in action at the end of this on-demand webcast) enables Microsoft Dynamics NAV user perfoming an end-to-end service process, and hence taking its NAV-backed service business to a new level. 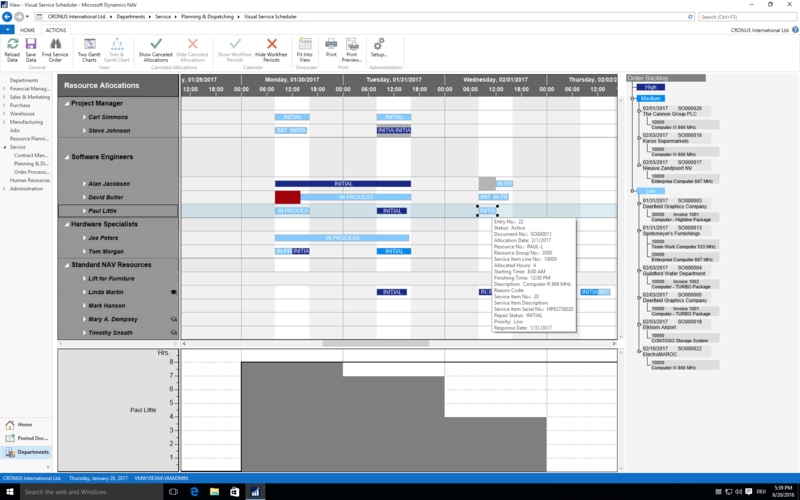 Want to learn more about visual service scheduling in Microsoft Dynamics NAV with our Gantt chart add-ins? Schedule a demo now.